13-Dec-2014, Proposed meeting to view the Geminids Meteor Shower, at the Newton Stewart Golf Clubhouse. The meeting was only to happen if the weather was clear for viewing, which it turned out not to be, and so it was cancelled. 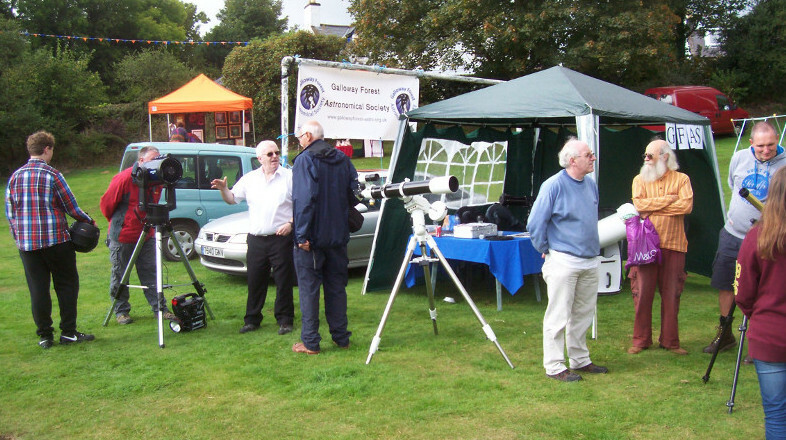 11-Oct-2014, Galloway Forest Astronomical Society AGM, 10.30am in the Belted Galloway, Newton Stewart. The AGM was successfully held at the Belted Galloway on Saturday 11-Oct-14. The Management Committee was re-elected unchanged and a minor alteration to the constitution was approved. It was agreed to accept Dr Robin Bellerby's generous offer for the shell of the observatory, so we no longer have to face the costs involved in moving it. We also have a bit more cash in the kitty to start fundraising for building a new one. We reviewed the membership classes and decided on: Juniors up to 16 years FREE; Students 16 – 22 years £10.00; adults £15.00 and Family membership £25.00. If you haven't paid your subscription for 2014/2015 yet, please do so. Thanks to all members and interested parties for attending, and to the Belted Galloway for the refreshments and the use of their premises. 20-Aug-2014, Day of the Region Event, New Galloway. The GFAS Stand at the Day of the Region Event. There was considerable interest in the GFAS stand at the Day of the Region, with a steady stream of people wanting to know more about the Society and the equipment on show. The weather was pleasant, but not ideal, with cloud often preventing viewing of the sun with the specially protected Coronado telescope. Those demonstrating the Coronado telescope were at pains to stress that trying to view the sun with a normal telescope would cause instant blindness, and only the special protection built into the Coronado allows for safe viewing of the sun. The two large telescopes were focused on the top of a monument in the next field, so that people could judge the quality of the images they produce in daylight. Later, in the evening session, the cloud gradually cleared as the evening progressed, and we did manage to view and discuss some of the constellations, stars and galaxies that were visible. 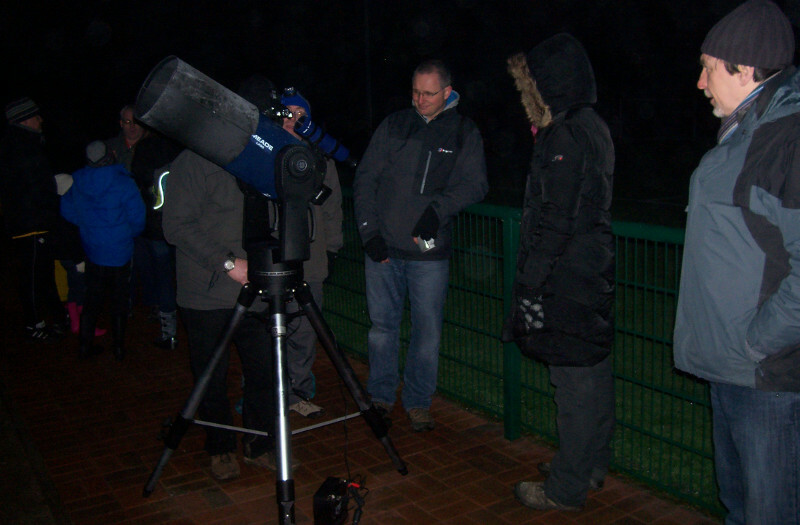 Our aim of imaging the Triangulum Galaxy was too much for the conditions unfortunately, but the level of interest in the equipment, the Society, and astronomy in general, was encouraging and did make this a good event for the Society to take part in. Using a specially protected Coronado telescope to view the sun. 10-May-2014, Members and Guests Night at Creebridge House Hotel. The 9.30 pm meeting started with thick cloud, so we were inside to see a slideshow of recent pictures that Robin and Brian Rice had taken. Next we had a slideshow from Doug Snell about Saturn and its numerous moons. Then came another talk by Robin and Brian showing us the two telescopes, cameras, and other equipment, that were used to take their photos. By this time the cloud had broken up to be patchy enough to allow the telescopes to move outside, giving us views of the Moon, then of Mars, and finally of Saturn. The viewing was good enough to allow the rings of Saturn to be clearly seen, although the moons of Saturn and the Cassini Division were probably a step too far for the conditions. The viewing continued to nearly midnight, when a heavy shower of rain brought a close to the proceedings. Many thanks to the Creebridge House Hotel for the use of its dining room which proved to be excellent for the slide shows and gave easy access to the garden for outside viewing. Also thanks to Doug for his talk on Saturn, and to Robin and Brian for their photos, telescope talk, and setting up outside for the later viewing. The slideshow on Saturn is now available to view on this website. 12-Mar-2014, Members and Guests Night. 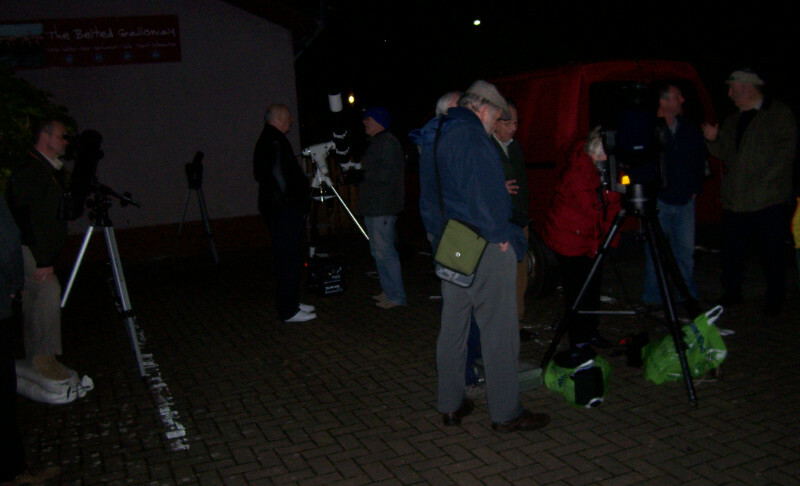 The telescopes set up outside the Belted Galloway, 12-Mar-14. About sixteen members and their guests came to the meeting at the Belted Galloway, Newton Stewart, for an introduction to the use of the society's telescopes and digital photography equipment. Some members brought their own telescopes to get advice on how to set them up and get the best from their equipment. After tea and coffee, there was a slide-show presentation on the constellations and finding your way around the night sky. Thanks are due to Robin and Brian Rice for looking after the telescopes and the practical session, and to Doug Snell for putting together and delivering the slideshow. Also thanks to the Belted Galloway for opening up for the meeting and for supplying the tea and coffee. For anyone unable to get to the meeting you can still see the slideshow, click on the Slideshow link in the section at the left of this page. 27-Feb-2014, The Aurora visible in Galloway. 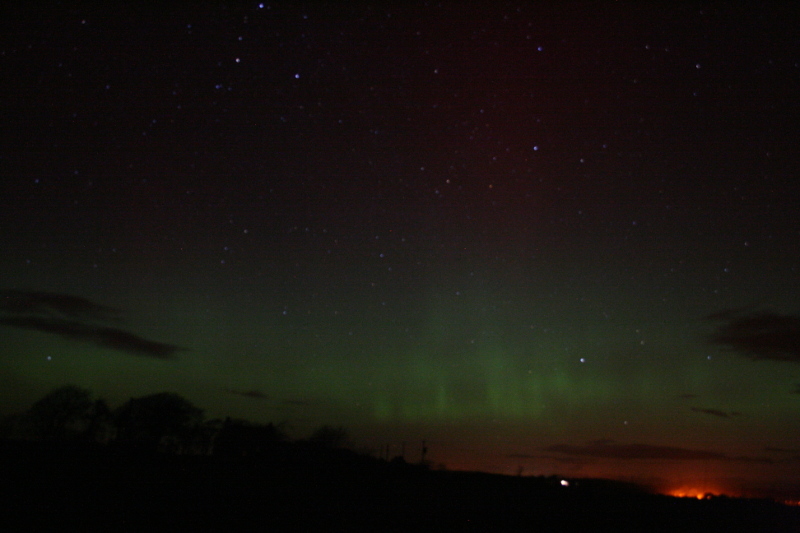 The Aurora from near Sorbie, 27-Feb-2014. It is fairly rare for the Aurora to put on a show this far south, and when it does most of us miss it anyway! Fortunately Stuart McGlashan was ready and waiting with his camera so that we can see what we missed. This picture was taken at about 10.15 pm with a Canon 400D, and the settings were a 10 second exposure at F4, at ISO 1600. Thanks to Stuart for his permission to show it here. Due to cloudy skies, plans were changed from the original visit to the Observatory, and the meeting was held in the Newton Stewart Community Centre, where about twenty Beavers and helpers had a talk and slide show on the more prominent features of the night sky. The slide show featured Ursa Major, Ursa Minor with Polaris, and Cassiopeia in the northern sky; and the Pleiades, Orion, Taurus and Canis Major with Sirius in the southern sky. There was also a demonstration and short talk on using a telescope, and the evening was rounded off by presenting personalised certificates to all those that attended. Feedback from the Beavers has been good as shown by a quote from one of the Leaders, “they did enjoy it and loved their personalised certificates - that was a great touch!” Special mention is due to Doug for organising the slide show, talk and certificates, and to Robin for doing the telescope demonstration. Brian and Robin Rice, our most experienced observers, have been watching the new supernova in the nearby galaxy M82. Only discovered on the 21st January when cloud prevented an astronomy class from viewing their intended targets, the supernova has been confirmed as an exploding white dwarf. What looks like a new star is really the death of an old one. 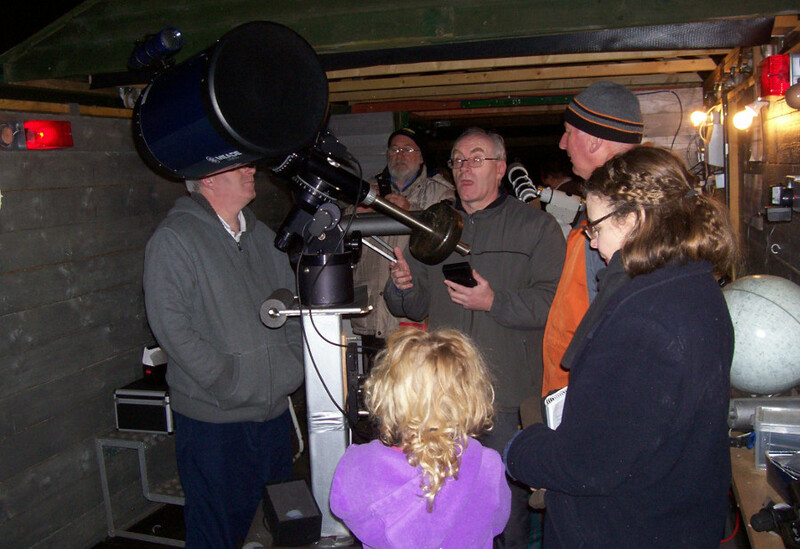 Brian and Robin were using a twelve inch dobsonian telescope to observe the supernova on the 26th January. It is expected to reach peak brightness in the first week of February. The galaxy M82 can be found between the Plough and the Pole Star. Search online for “M82 supernova” for more information. 11-Jan-2014, Stargazing Live! Event at Blairmount. At the Stargazing Live Event, 11-Jan-14. The Stargazing Live event held at Blairmount Park on Saturday was lucky to have clear skies and good viewing conditions for the telescopes, and good attendance by a wide age range of people. The night sky was dominated by a bright moon that clearly showed its craters and features to the viewers there. January is the best month this year to view Jupiter, and as it rose in the sky all the telescopes focused on this planet. Good views of Jupiter showed its dark bands, and its four main moons, two on either side of the planet. With clear conditions came the frost, and people were glad of the opportunity to go into the Football Pavillion to see a slide show and talk about galaxies, and warm up with tea and biscuits. The Galloway Forest Astronomical Society (GFAS) would like to thank all those that came to the event and made is such a success, and also Newton Stewart Football Club for the use of their pavillion. 01-Dec-2013, Introduction to the Observatory and Telescopes. Robin demonstrating the ten inch reflector telescope and its tracking mount. The meeting at the observatory at Glenamour, DG8 7AE, on Sunday December 1st at 3:30 pm was well attended, and those present were given a demonstration of the main telescopes that the Society has. This included how to set up the mounts so that the automatic tracking will know where it is, and continue to follow the chosen object by compensating for the rotation of the Earth. This is vital for astrophotography where long exposures are normal for distant objects. Once the tracking is set, the system can be told to go to named stars or planets, using its own internal star map. So although it does take some time to set up the tracking properly, once it has been done it allows quick and easy access to all the available stars and planets at the time. It was hoped that we might do some real observing too, but unfortunately the cloud rolled in and there was nothing that could be done. However, it was a very interesting meeting, and a lot was learned by the newcomers like myself. Our thanks go to Robin and Brian Rice for doing the demonstrating and sharing their knowledge and experience with us.